The full-Features Note: This product is design specifically to fit Yardistry's Gazebos. DOES NOT INCLUDE GAZEBO. Available for 12' x 14' (Item #282835588918). 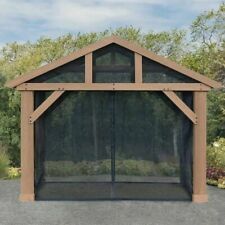 12 ft. Privacy Wall Accessory for Yardistry Gazebos. Yardistry's 12 ft. Privacy Wall is the perfect add on to your. existing Yardistry 12x12 or 12x14 Wood Gazebo. Yardistry’s unique privacy wall design has you covered. 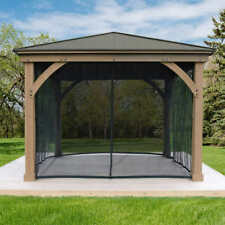 Note: This product is design specifically to fit Yardistry's Gazebos. Available in size. The full-Features Note: This product is design specifically to fit Yardistry's Gazebos. DOES NOT INCLUDE GAZEBO. Heavy Duty Zippers. Full Length Panels. Available for 12' x 14' (Item #282835588918). Note: This product is only compatible with Yardistry's 14 x 12 Pavilion with Aluminum Roof. 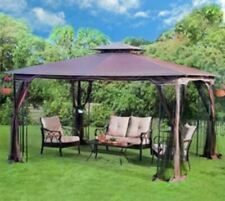 This Steel Gazebo Canopy Kit is the perfect addition to your outdoor furniture. This Canopy Kit includes mosquito netting, plant rings, corner shelves, ground stakes and a hook for the center to hang lighting or a fan. Note: This product is design specifically to fit Yardistry's Gazebos. CANCELLATION REQUESTS MUST BE SUBMITTED WITHIN 48 HOURS OF ORDERS. Available in two sizes. Transform your patio area into an outdoor getaway with the Deck Gazebo Large. A patio set and table fits beautifully under the angled hexagonal roof, so you can dine in style no matter the weather. If you're worried about bugs crashing your party, don't be. Type Carport. Roof Color Clear. Roof Width (Feet) 18. Roof Length (Feet) 20. Interior Peak Height (Feet) 6.5. Exterior Peak Height (Feet) 9.92. Trim Color Gray. Arches: 16 gauge galvanized steel. Expand your outdoor living space using the Wood Gazebo. The Wood Gazebo with Aluminum Roof adds character. the Wood Gazebo with Aluminum Roof can accommoda te. The Wood Gazebo by Yardistry is a multi-functional. Wood Gazebo with Aluminum Roof. Expand your outdoor living space with this beautiful Wood Gazebo. The Wood Gazebo with Aluminum Roof adds character to any area. The 100% FSC® Certified Cedar Lumber is finished with. This rugged gazebo is made of aluminum and steel. you are advised to consult your local city, municipality. The Siena Hard Top Gazebo is design for 12 month use. Even candlelight reflects back down and illuminates. Note: This product is only compatible with Yardistry's 14 x 12 Pavilion with Aluminum Roof. Fits 14' x 12' Wood Pavilion. Full-length panels and Heavy Duty Zippers on all four sides. Heavy Duty Zippers. Full-length panels and Heavy Duty Zippers on all four sides. Fits 14' x 12' Wood Pavilion. Note: This product is only compatible with Yardistry's 14 x 12 Pavilion with Aluminum Roof. 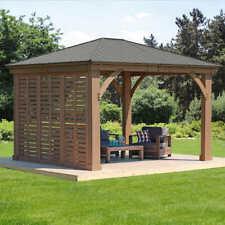 Gazebo/Pergola Feature Pergola Roof & Shade. Includes Shade Kit Only (upper slats). Premium alternative, high end, advanced technology. 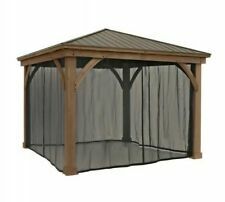 Type-Gazebo/Pergola Gazebo/Pergola Add On. Manufacturer SKU VA42024.